International media has been actively discussing the recent publication of the British edition of Mirror Online featuring shocking footage of Islamic State (ISIL) militants gunning down a total of 200 children, with their hands tied behind their backs. It should be noted that it is not the first time that militants executed their captives, but such massive public executions haven’t yet been published on the Internet. Although there’s no way to establish the veracity of the footage, it’s but one case in a series of documented violence and criminal activities of the terrorist “Islamic State.” It is this very group that is not ashamed of its twisted fantasies of abusing and killing civilians, which also tries to establish prominence through these very acts of violence. ISIL militants have repeatedly uploaded footage of executions of their prisoners on the Internet. In some of those videos, captives are run over by a tank, or dragged behind a speeding car, some victims were burned alive, blown up, beheaded or had their throats cut. It’s clear that we are witnessing a barbaric rendition of the Nazi’s atrocities, even a bold attempt to surpass them. The same uncontrolled violence has been applied to those ISIL militants that have fled the field of battle, as was the case with the recent execution of deserters in the northeastern Iraqi city of Baiji. There’s little doubt that the so-called Islamic State, a self-proclaimed, unrecognized quasi-state with its Sharia “capital” in the occupied Syrian city of Raqqa, is one of the most significant threats to global security. In just three years these terrorists have managed to capture vast areas in Iraq and Syria. In addition, they’ve been trying to expand their influence into the countries of North Africa, namely in Libya, Central Asia, the Caucasus and other regions. According to various estimates, in June 2015, the Islamic State occupied the territory of some 300,000 square kilometers with a population of around 8 million people, mainly composed of Sunnis. Back in May of this year ISIL controlled 50% of Syria’s territory and 40% of Iraq’s territory. Neither Al-Qaeda, nor any other known terrorist group has such a complex organizational structure. In fact, the Islamic State has a lot of attributes of a real state, with its own income, social support programs, propaganda machine and rigid control over its occupied lands. As for the growing need for weapons that the Islamic State faces as it expands, there’s a considerable body of evidence suggesting that it is using US army munitions, stolen from Iraqi stockpiles and taken from Syrian opposition forces supplied by Turkey, Qatar, Saudi Arabia, and the US. After the capture of Palmyra and Idlib, the Islamic State has acquired tanks, infantry fighting vehicles, anti-tank missiles and heavy artillery – they have even gotten their hands on American MANPADS – portable anti-air missile systems. The close ties that the US and its allies have with the Islamic State have been reported by various media sources from around the world, while providing a large amount of evidence that not only testify to the involvement of the White House in the creation of ISIL, but Washington’s participation in the training of its militants. In particular, this statement can be exemplified by the publication of a report drafted by prominent US political pundit and essayist Noam Chomsky in the Egyptian Al-Ahram newspaper back in November 2014, where he stated that ISIL is the direct result of US and Saudi Arabian policies. This fact is confirmed by statements of Iraqi authorities released in March, according to which they have arrested three American military advisers that assisted ISIL in the preparation of military operations in Iraq. There is also evidence regarding the involvement of US intelligence in the arming of ISIL militants. For these purposes, military transport aircraft, flying from Jordan, Saudi Arabia and Qatar, have been used. 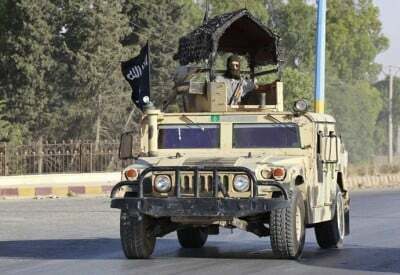 In November 2014 the Iraqi Intelligence Service released an official report which stated that ISIL was being assisted in the fight against Iraqi security forces by the US, carried out in the form of weapons crates being dropped by US military transport planes to ISIL fighters. In June 2014 Aaron Klein in an article for «World Net Daily» reported that ISIL militants were trained in Jordan in 2012 under the supervision of American instructors, whose activities were strictly classified. The conservative organization Judicial Watch published declassified reports of the US State Department and the US Department of Defense, presenting evidence that in 2012 the intelligence services and the US administration deliberately assisted ISIL terrorists, in hopes that this terrorist group would help them topple the legitimate Syrian government and assist in other political adventures of the White House, similar to the well-known plot in which the US provided support to Al-Qaeda in its confrontation with the Soviet military in Afghanistan during the 1980s. As a result of the lawlessness and terror imposed by the Islamic State on its occupied territories, thousands of civilians have perished, and millions of refugees lost their homes and are now trying to seek refuge in the countries of the Middle East, Turkey and Europe. In their brutality, ISIL militants have already surpassed Nazi Germany’s war criminals, who had subsequently faced trial on October 1, 1946 in Nuremberg to receive justice for their barbaric acts. So what is preventing the international community from establishing a similar tribunal on the basis of international law, that will pass its judgement on the criminal activities of the Islamic State and those countries and political forces that have been supporting them?